I first found Paidarion after the release of their second album, Behind the Curtains, back in 2011 and A Leap Into the Unknown was one of my favorite prog songs of that year That pipe organ/synthesizer opus is still a cherished favorite. Their first album, Hauras Silta, from 2009 still remains a mystery…but not for long as I have ordered it. The band returns in 2016 with a new album under the appended Finlandia Project name. 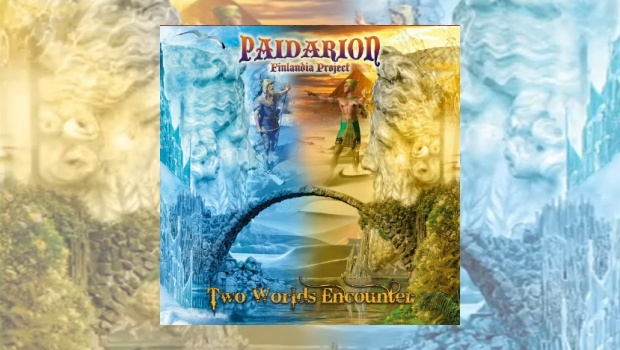 Two Worlds Encounter began as an idea to invite special guests to perform with the band on a tour of Finland in April 2015. After the shows these guests – vocalists Jenny Darren, Kevin Moore and Robert Webb (from the band England, who also adds keyboards and acoustic guitars), guitarist Bogati-Bokor Akos and keyboardist Otso Pakarinen – were invited to join original band members drummer Kimmo Pörsti and bassist Jan-Olof Strandberg to make the new album. Colin and Wendy makes for a fantastic start, Jenny Darren’s vocals soaring against great keyboards, powerful guitars and solid drums pounding out the beat. Billy Would Climb has an almost Dan Fogelberg acoustic feel to it, at the opening. Darren sings with acoustic guitar accompaniment before drums and electric bass and guitars join in, keyboards later adding more depth and prog strength to the song. Flute-like keys open Fragile Bridge, making the sound like something out of Middle Earth. Darren returns with excellent lyrics and great support from the rest of the band, heavy electric guitars strengthening the sound with keyboards and synthesizers taking over mid-way through. Jungle Fever is a jazzy instrumental, full of unique keyboard sounds, bass and guitar work mixed in helping to prevent overload. This is easily one of my favorite tracks here, as is Grand Canyon of My Dreams, full of string orchestration, keyboards, and layered guitars – as big as the canyon it describes with Darren delivering a powerful message, a great mix between Ann Wilson and Grace Slick. In contrast, acoustic and then electric lead guitars open Yellow, like wind through the evergreens before Darren sing, “To see the morning sunrise every day…I cannot wait…”. An excellent song to begin the day, Yes-like guitar is then surrounded with the sound of strings. One of the album’s best tracks. Cloudberry Sky is similar but presented as a full acoustic guitar instrumental, creating a calming, fireside feeling, Bogáti-Bokor Ákos doing a fantastic job in freeing the imagination. Ode to Billie Joe follows the story with a different, European sound. It’s my least favorite track on the album, but I respect them for recording the song, which is obviously a band member favorite. Horseman to Symphinity is an excellent long track with powerful keyboard instrumentals and plenty of great guitar work. Why Oh Why has an unexpected country beat to it, twangy guitar parts leading to keys and synths, reminding that even ELP recorded a song named Hoedown. Finally, Hahmo is a powerful closer that opens with mysterious keys and plenty of good electric guitar. This is a wonderful ‘meeting of the worlds’ kind of album which brings together American songs and Finnish folklore, all surrounded with great musicianship.